newznew (Chandigarh) : Do you feel bloated and your trip to the bathroom has been unsuccessful? Are you irritable, uneasy, have mood swings and nausea, feel like vomiting, have a swollen abdomen or abdominal pain? Chances are that you are suffering from constipation. 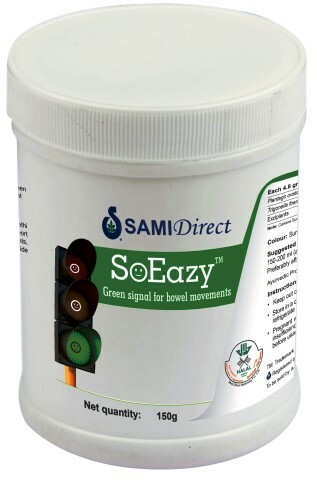 Sami Direct has recently launched ‘SoEasy™’, a natural laxative with no preservative for people suffering from constipation. Constipation usually occurs due to the lack of fiber and/or water in the diet. It could also occur due to the lack of physical exercise or can be a side effect of some medicines. Constipation requires straining to pass motions, which may cause slower blood circulation resulting in clotting of blood. Constipation negatively affects social and professional lives causing personal anguish. There are no glaring external symptoms as such, so while a person might look hale and hearty from the outside, been constipated could be slowly eating him/her up from within. The most common psychological impact is feeling irritable, lack of interest in work, mood swings, worry and embarrassment. The main ingredients of Sami Direct’s SoEasy are Psyllium Husk and Fenugreek seeds, which are produced organically, free of microbes, insect fragments and heavy metals. Speaking on the launch Dr. Muhammed Majeed, Founder & Chairman, Sami Labs said, “A recent survey showcased that nearly 14% of urban Indians are suffering from constipation, higher than the global average of 10%. A person is considered to be constipated if he/she has not had bowel movements in three or more days consecutively. Research shows that 3 in every 5 people suffer from constipation in their lifetime. Constipation is not something that one needs to be embarrassed about. It can be relieved by the use of natural laxatives that are made from dietary fibers— soluble and insoluble— sourced from plants. Upon consumption, such laxatives can absorb water and bulk up the stool thus facilitating the bowel movement”.